BEFORE: I wrap up my surprise chain of 2005 Best Picture nominees with Brokeback Mountain. Heath Ledger (last seen in The Patriot) and Anne Hathaway (last seen in The Dark Knight Rises) star along with newcomers to the marathon Jake Gyllenhaal and Michelle Williams. AFTER: Conflict makes films, or any kind of storytelling for that matter, interesting and exciting. Without conflict, a story can still exist, but there isn’t much of a reason for the viewer to keep watching. There is a major lack of conflict in Brokeback Mountain for much of the first half of the film. In a sense I can understand what Ang Lee wants to show. The beginning is all about the formation of Ennis Del Mar’s (Heath Ledger) and Jack Twist’s (Jake Gyllenhaal) relationship and the point isn’t to have major issues; yet. Later on, after the wives are introduced, is when there is a lot of conflict and the film picks up. The best part about Brokeback Mountain is the consequences of Ennis’ and Jack’s relationship, not necessarily the relationship itself. Of course forming the relationship is an important part because you couldn’t have the conflict without it, but to spend so long building up before the big payoff, the interest and excitement fades away and leaves the viewer unengaged. 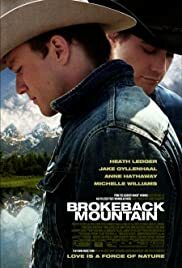 The great performances across the board from Ledger, Gyllenhaal, Williams, and Hathaway make Brokeback Mountain at least eligible to be seen once. But the underperforming story makes it an unlikely candidate for a second viewing.